The introductory paragraph here is based on information presented in the excellent revision of New World Opostegidae by Davis and Stonis (2007). Opostegidae has its greatest global diversification in the New World tropics (83 described species, representing 42% of the world total), but only ten species (one in Opostegoides and nine in Pseudopostega) are known from North America north of Mexico, and five of these are restricted to the far southern region of the USA. Life histories are known for only 6% of described species of Opostegidae. Larvae of these species are internal feeders, the host plants of which encompass a wide range of families, depending on opostegid species. Of the species known from temperate North America, only Opostegoides scioterma has been reared. The larva mines in shoots of currant and gooseberry, Ribes spp. (Saxifragaceae) from May through June (Hudson Valley of New York), after which the larva leaves the mine to pupate (in the upper soil layer, within a dense silken cocoon) for approximately two weeks before adult emergence. 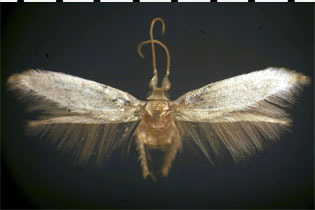 Adult opostegids are very small moths; in structure and shape, they somewhat resemble moths of the related family Nepticulidae, especially in the "shaggy" head vestiture, large basal eye cap on antenna, and relatively short, broad body and wings. Opostegids, however, average slightly larger in size than all but the largest nepticulids, and the forewing coloration of Opostegidae differs from that of Nepticulidae in being predominantly either white or gray. Also, the wing venation of Opostegidae differs from that of Nepticulidae in being "the most reduced of any fully alate moth" (Davis 1989), with only three or four unbranched veins, and no cross veins or closed cells, in the forewing. Aside from the two species covered below, two additional opostegid species, Opostegoides scioterma and Pseudopostega albogaleriella, have been reported from Illinois (Godfrey et al. 1987; Davis and Stonis 2007). In Illinois, adults of Pseudopostega cretea (Fig. 1) have been collected at light in June and July, with the greatest concentration of dates occurring in mid- to late June. In the Midwest, the species displays two color forms, one white and the other light brownish gray. Figure 1. Pseudopostega cretea. Adults, collected at UV light; left, white form; right, light brownish-gray form. Pseudopostega quadristrigella (Fig. 2) has been collected at light in central Illinois in mid-June. Figure 2. Pseudopostega quadristrigella. Adult, collected at UV light.